You’ve seen the leaked shots and perused the brochure. 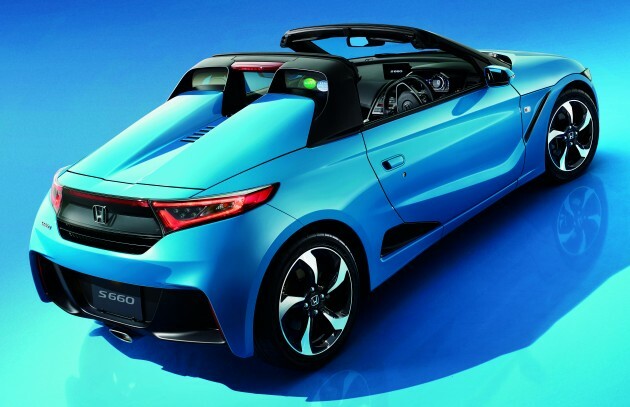 Now, the Japanese automaker has officially dropped the bomb on its new Honda S660 kei-roadster. On sale in Japan from April 2, the petite open-top sports car will also be offered in a limited edition trim (660 units), dubbed the Honda S660 Concept Edition. Drawing inspiration from the Honda Beat of the 90s, the Honda S660 retains the same mid-engined, rear-wheel drive layout for a near-perfect 45:55 (front to rear) weight balance. In terms of its outlook, the Honda S660 is styled after the concept of what Honda calls an “energetic bullet” – and it shows. Much has been retained from the original concept that made its debut back in 2013. The broad front grille gets flanked by upswept head lamps while the wheels appear to have carried over the same design, as well – albeit wrapped in thinner tyres. At the rear, the most noticeable change would be that of the exhaust outlet – a single, centrally-mounted layout replaces the twin setup from the concept. Power figures are just as modest – which, in an 830 kg car like this, is no bad thing. A 660 cc, turbocharged DOHC three-cylinder engine with 64 hp and 104 Nm of torque propels the S660 to an estimated top speed of 140 km/h. Transmission options include a six-speed manual (a world’s first for this segment according to Honda) and a CVT transmission with paddle shifters. 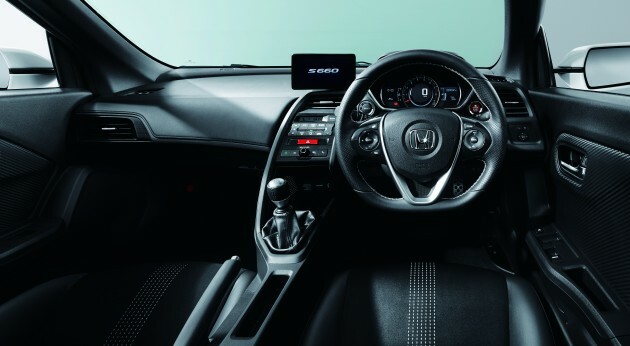 Taking centre stage on the inside is a 350 mm steering wheel – the smallest in any of Honda’s production cars – coupled to a driving position “that gives the driver a feeling of driving a go-kart.” Going for the wind-in-your-hair experience is easy thanks to a “roll-top” that features a “lightweight and easy-to-operate” construction. A “mid-mode” system for the air-con channels air to the thighs and waists of both occupants. Elsewhere, a digital speedometer is framed by a conventional rev counter while atop the centre console sits a tablet-esque screen. In one of the two trim levels on offer, the a-spec car will have its driver’s seat (in light grey) trimmed in a combination of leather/Luxe Suede while the passenger seat comes in dark grey or black. The entry-level b-spec car will feature black seats trimmed in a combo of mesh and fabric. Safety kit is aplenty of the Honda S660 with the inclusion of a highly-rigid frame with augmented front and centre pillars to help keep occupants safe in the event of a rollover. Four airbags are standard with the passenger’s system adopting what Honda calls an “internal pressure holding airbag system” that keeps the airbag inflated for longer periods. Elsewhere, Vehicle Stability Assist, Hill Start Assist, Emergency Stop Signal are featured as standard while Honda’s City-Brake Active System is available as an option. New on the Honda S660 is the Agile Handing Assist electronic control system which uses brake torque to stabilise the vehicle mid-corner. On the limited edition Honda S660 Concept Edition, a Bordeaux red roll-top, two-tone side mirrors and a water-repellent “Ultra Glass Coating NEO” treatment is standard. Inside, red accents help mark it out along with an aluminium plate bearing the car’s production number. Prices for the entry-level b-spec car begin at 1,980,000 yen (RM61,592) regardless of transmission choice while the a-spec car carries a price tag of 2,180,000 yen (RM67,813). The S660 Concept Edition retails for 2,380,000 yen (RM74,035). Premium Star White Pearl, Premium Mystic Night Pearl, Admiral Grey Metallic, Premium Beach Blue Pearl, Carnival Yellow II and Flame Red make up the colour palette. You won’t go wrong with sushi car, especially Toyota. GT86 better watch its rear. Aiyah, K-car la. The engine capacity and power output(emissions/ fuel economy) limited to qualify for k-class. I’ve driven a friend’s Suzuki cappuccino and I can tell you that it is fast and can wheelspin when turning in corners. Here apa k-car, Eco or hybrids also taxed heavily, we won’t be getting it cheap. Same here… I just want to have one for weekend morning drive. What a car. I’ll take the yellow one please. Provided they put in the 1.0 turbo inside. Looks great and handles like a dream – balanced and sorted. Hardly any oversteer (forget about using this for drifting) or understeer, based on online reviews. Sadly, you can’t switch off the traction control. If this is the price in msia then i wouldve bought it cash. Awww.. come on. MX-5 will be making it here, why can’t this along with the Kopen. Honda Vezel = 1,870,000 Yen starting price. when reach malaysia, CKD by the PRoton owner – DRB Hicom. can hit RM110,000 starting price. RM110k for a 140km/h top speed Go Kart Kosong. up to RM150k for Go Kart High Specs. Better bring in a CBU.. dont trust DRB-Hicom CKD quality. RM130k for a Japan Quality, Good to keep. keep, drive and show off. HRV selling almost the same price in Japan. So if they bring in to Malaysia… RM110k?! Wish it is. But remember HRV is CKD. If, and that is a big if, the S660 comes here, it will be most probably CBU from Japan (the land of kei cars after all). A better comparison is the CRZ which is CBU from Japan. That one costs around RM180k now. JPY converted still need 62k?!?! Dahsboard hints of the next-gen s2000.. The red one reminds me of the original NSX…. Bring one in around 100k and I want one now!! Actually sales tax should be gone and only left with import duty. Is it 40%? If so should be around 100k plus whatever profit Honda wants to make out of this. This is also placed below CR-Z so is 180k CBU imported it should be lower than that. To make it very relevant, just price it like CR-Z with hyrbid tax exemption. Bear in mind that that don’t make cars for the people to afford one. They make and sell cars to turn a profit. I’ve seen the road test video of this car in YouTube, looks very nice. But the roof, adui you need to manually fold/unfold it each time. Plus the compartment of the foldable roof is in the front boot. The less practical CR-Z is more practical than this. Oh well, MX-5 then. Looks great but at 140kph max, what’s the feel when it get smoked by Axia, Viva? I can imagine everyone bashing Proton if they ever make something like this, so why the lavish praise to Honda now? uh, simple.. cuz honda has done it tastefully, enough said. no la bodo..cuz Malaysian are bias..period. Seriously, at 140kph max, what’s the feel when it get smoked by Axia or Viva? If you open top of course you smell all the smoke on the road. Too bad this car won’t be coming here as an official import. Another nice car in this genre is the Daihatsu Copen. Just wait and see what those famous tuners at Japan will do to this car. Being a turbocharged car, it won’t stay modest at 64hp only after these tuners got their hands on it. In a perfect world, driving schools use this car. It’s not powerful enough to do anything silly and im sure it handles great. read again. the 660 units are for the S660 Concept Edition. normal edition is the production model, unlimited as long as theres demand. Probably Malaysians will get the used car versions thru grey importers in the next 3-5 year’s time. Just maybe. If sold here will become a rm200k car ha.. ha. We are all screwed.